That Sorraias had a significant influence on the Andalusian and Lusitano, especially the latter, can't be denied—too many Lusitanos and not just a few Andalusians show Sorraia characteristics. Some Lusitanos are practically indistinguishable from Sorraias, except being larger in size. In a scenario with a remnant population of wild horses and extensively-kept domestic horses, it has always been the same story the world over: wild stallions stealing domestic mares. It is rather probable that this has happened also in Iberia with wild Sorraias. A stolen mare may be reclaimed, but might have conceived a foal by the wild stallion. 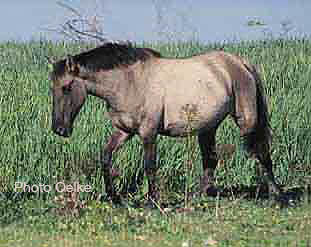 Trouble with wild stallions was a main reason for the elimination of wild horse populations all over the world. Such reports exist about wild Tarpan stallions, stallions of the Mongolian wild horse, and also of feral stallions (mustangs) in the American West. Later, toward the end of the days of free-roaming Sorraias, some remaining mares may have found their way into the Lusitano and Andalusian gene pool.